This position is part-time and unpaid, however students who are looking to receive course credit are welcome. The spring intern will work with gallery owner, Cris Worley and gallery assistant, Nicole Norton in the administration of the gallery. The big annual student expo at 500X in Dallas is often one of the best places to see, under one roof, what Texas art undergrad and grad students are getting up to. Call for entries for the February 2015 show has started, and this year’s jurors are Susan Roth Romans and Jordan Roth, who own Ro2 Art, a contemporary art gallery in Dallas. All media will be accepted, from students across the state, and this year 500X is using slideroom for entries (as opposed to 500X’s annual open show, in which entries have to dropped off at 500X to be considered, which is unusual these days. I digress). Submissions for the Student Expo are due by January 25, and students will be notified of acceptance by Feb. 1. Instead of recycling the same entertainment news stories or publishing commonplace editorials, The Artifice focus on unique topics that are intellectually stimulating and meaningful. You can write about a whole host of things for pleasure, passion and/or to boost your CV with vital experience in this ever competitive media environment. Last week we got to experience two more presentations of BFA candidates. First up was Blu Dornan with Finding My Voice…an Exploration of Portraiture. Blu discussed several of his pieces. The first being an oil of his father braiding rope. Blu stated that the image represents a defiance of health issues that his father had experienced. He is piecing his life back together, although not perfect but he still perseveres. He featured other unique ways to represent portraits. One being a representation of his friend Nick Pernokas with a tie down strap. The tie down represents their relationship in that Mr. Pernokas is there when he needs someone to keep him level. Blu also includes photographs of dairies in the Stephenville area. The ‘portraits’ of the dairies are named with inspiration from the Greek Empire. Representing the decline of the local dairies. Blu plans to get himself out in the commercial world with working more in western art. Blu presented a unique way of showing portaits of the people that surrounds him that in turn can be a self portrait. On the same day as Blu presented, Heather Weeks took to the podium. Heather decided to toss her previous idea of her senior show and set herself free with colorful paint and a blank canvas. She stated that she typically focused on a subject but with her senior show she wanted the freedom of allowing the paint flow for itself. She needed to get excited about her work again and by her presentation the audience could really feel that. Heather said that her pieces capture a moment in time and that she does feel an emotional connection to each piece. She plans to take her new found freedom into her future! Great job Heather! A few days later we got to experience two more BFA candidates. Cam Rich brought to light constructivism with modern brands. Brands are constantly tossed in our face. Cam equated such acts with Russian propaganda. He built interesting posters using a darker and minimal color pallet and the subject of brands such as Starbucks, McDonalds and Red Bull. To top it all off Cam built a wall and plastered the posters to it. This overlapped the media, possibly to discuss how media’s insistent presence can be overwhelming. There was some discussion of this media acting as art or aimed more towards design for the specific companies. In my opinion this was a great act of art and the best type; the type that creates discussions and makes the audience think. However, the most meaningful opinion in the room was that of Mr. Davis and it is safe to say that he was impressed! Congratulations Cam, we look forward to seeing more of your work. Along with Cam came another great presentation by Brittany Broussard. This gal has been busy this semester, she took on branding an entire company. Dad’s Specialty Printing is a local business that Brittany did some work for and vamped up their entire brand and marketing system. She didn’t just create a logo, she assisted on the aim of the business and getting their name out there. She designed shirts, packing material, business cards, a commercial and built a website. She really took on what some of us graphic designers look forward to doing in our future. It was said that Brittany had a superior presentation. Something we can all agree on! Great job Brittany, you are an inspiration for other Digital Media students! Last and certainty not least was Tracy Dominguez whom took to the podium this week. Tracy is another inspiring woman whom finally followed her dream of becoming an artist. With her senior show she took to oil on canvas with subjects from Fossil Rim Wildlife Center. Tracy wanted to explore the animals interaction with humans. Fossil Rim is the place for that. She featured three pieces of four animals; emu, zebras, giraffes and white tailed deer. She photographed the animals and then took to the canvas to recreate the images in her own way by adding unique colors and interesting backgrounds. Some said that these pieces can be considered ‘selfies’ of the animals. 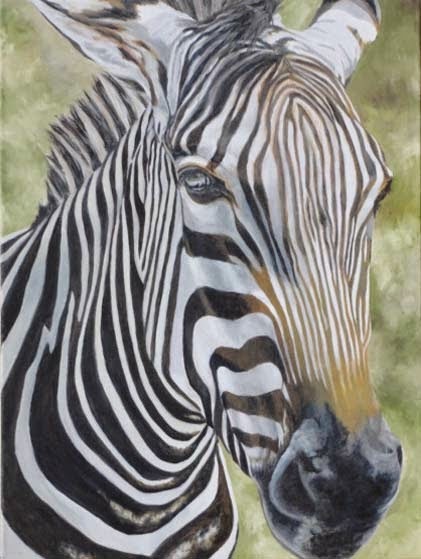 The pieces carry so much personality of the subjects and really gives the audience a nice connection to these creatures. GREAT GREAT GREAT job seniors this semester! There has been word that this has been one of the best collections of senior BFAs our department has seen. Seems like we are getting better by the semester. The Department of Fine Arts presents the sixth and final BFA exhibition of the fall semester. The exhibit features the work of painter Tracy Dominguez, and will run from December 1st – 3rd in the Gallery of the Clyde H. Wells Fine Arts Center. The artist will be speaking about her work at a brown bag lecture on Tuesday, December 2nd at 12 noon in the TSU Gallery. Tracy Dominguez is a non-traditional student who has embraced an opportunity to follow her dream of obtaining a Bachelor of Arts Degree with Studio Art emphasis. After serving in the United States Air Force for over 28 years, she enrolled in the art program at Tarleton State University and is looking forward to pursuing her second career as an artist after graduation this semester. Her time in the military allowed her to travel throughout Europe, and she plans to resume traveling and exploring to provide inspiration and subject matter for her future works of art. All Art and Digital Media majors are required to give a public presentation of their work during their Senior Exhibit. There will be a Q and A from faculty and students, are all welcome to attend. The lecture will be Tuesday, December 2nd, at noon in the Fine Arts Gallery. All events are free and open to the public.